South Africa beat Kenya Lionesses with a sudden death try that was awarded after a TMO decision. 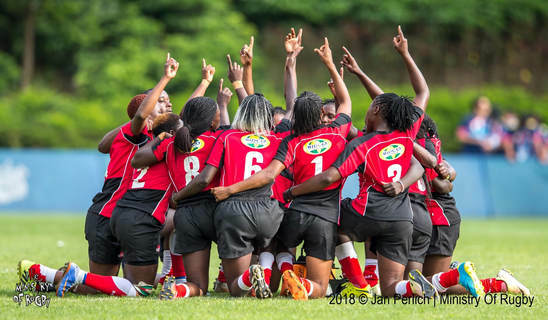 Kenya Lionesses staged a brave fight but fell to South Africa 12-7 in a last minute Television Match Official (TMO) decision in the Women’s Sevens World Series qualifiers at Hong Kong on Friday. Janet Okello replied almost immediately with after breaking from two South African defenders then dashing for the try. Doreen Nziwa made the conversion. With the 7-7 stalemate on full time, the match had to be decided on extra time sudden death and it was South Africa who were lucky after Ndawonde's match-winning score was confirmed by TMO. Kenya were reduced to six for the better part of the extra time. South Africa will face China in the World Rugby Women's Sevens Series qualifier final with the winner earning a place as a core team on next year's HSBC World Rugby Women's Sevens Series. FT : Kenya 17-5 Papua New Guinea. FT : Kenya 42-0 Mexico. FT :Kenya 24-12 South Africa.